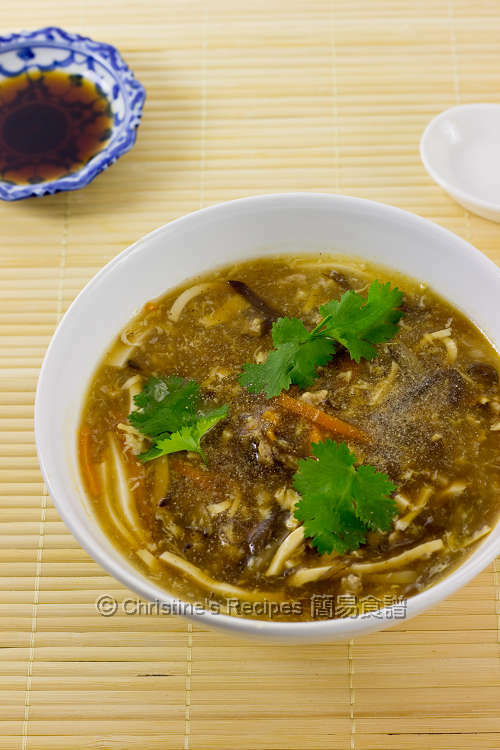 No matter the weather is cold or hot, this classic hot and sour soup, originated from Sichuan China, is suitable for every occasion throughout the year. It’s tremendously appetising and delicious. No wonder this soup is well-liked and popular around the world. Every family has their own version around different countries, using different ingredients though. 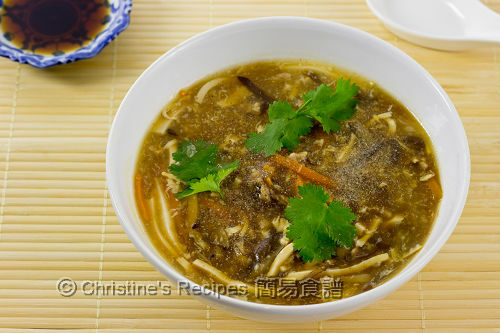 Basically, this hot and sour soup contains wood ear fungus, bamboo shoots and tofu, sometimes pork blood (豬血) is added. Give it a go if you want, or dare, or you can find some pork blood at your local area. To make this soup is very straightforward and easy. The tricky part of cooking is to get the right consistency with a balance of sourness and saltiness. You can easily turn this soup into a light meal by cooking some white Shanghai noodles to go with it. Mix the pork with the marinade. Shred all ingredients. Set aside. Use a large deep pot to heat oil over medium high heat. Sauté the ginger until aromatic. 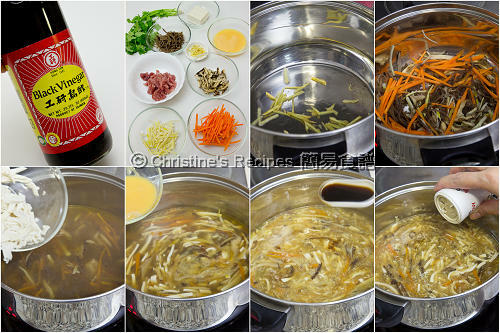 Add the carrot, bamboo shoots, wood ear and mushrooms. Stir to combine and cook until they start to be softened. Pour chicken stock and water. Bring it to a boil. Add the pork and cook until turned white. Add thickening. Cook to preferred consistency. Add the tofu. When it boils again. Remove from the heat. Slowly pour the whisked egg in a small stream while stirring the soup with a pair of chop sticks. You’ll get beautiful egg drop / egg flower in the soup. Season with light soy sauce, and salt if necessary. Add black vinegar and chilli oil. Sprinkle pepper. Remember to taste. Garnish with coriander. Serve immediately. You can skip the pork and use vegetable stock to make it vegetarian. It’s equally delicious. That said, this soup is traditionally made with 2 parts of soy sauce with 1 part of black vinegar. I like to go for a less salty version. Feel free to adjust the amount of soy sauce and black vinegar according to your liking. Generously sprinkle white pepper as mush as you like. Hi Christine, thank you for translating to English. Hi Christine, verry nice recipe can i add chicken and strip them and add in Hot and Sour Soup. Sure, you can use chicken instead. Equally delicious. thanks Christine for reply i'm going to cook this today. Hi Christine, the amount of chicken stock are not mentioned in the ingredient list, can I assume that the 2 cup of water = chicken stock? Thanks. Hi Christine, 1 cup measurement for the stock/water is equivalent to 250ml? I have always loved this soup & will definitely try your recipe. Thanks! I have put the measurements used in my recipes on the sidebar of this blog. Christine! Thanks so much for this recipe. my hubby and I had it last night and it was deliciooouss! I had always thought hot and sour soup was too daunting to make; it was so easy!--and comfort food-ish, and still pretty healthy! yum. I love it when I find really good recipes that I'll use over and over again! I tried this out and it turned out pretty tasty! It turned out that the whole brick of tofu I bought was a bit too much for the soup though... What do you consider a "brick"? I tried this out today and it was quite good! However, the brick of tofu I put in was a bit too much tofu. What do you consider to be a brick? Might be that the block of tofu I bought here was much smaller than yours, about 2-inch square. Feel free to use less of it to suit your taste. No need to have exact amount. I don't know where to buy black vinegar, could I use normal white vinegar instead? But black vinegar tastes far better than white vinegar when it comes to making this dish. Many Asian grocers will have stock. Got the Chinese version here. Hello Christine! Could I substitute chili flakes for chili oil? If so, how much should I put instead? Thank you so much for posting up this recipe! Why not? It depends on how hot you like. Try a bit first then taste it. If it's not hot enough, you can add more. I read your blog yesterday morning and made the soup in the evening! It is really cold here in Australia at the moment, so it was a perfect meal, made a little more substantial for winter with some rice noodles included. I added some chopped fresh chilli immediately after softening the ginger as there was no chilli oil in the pantry and substituted chicken for pork for the same reason. The soup was *really* delicious - thank you so much for the recipe!! How good was it? - my husband has requested it again this evening (unheard of)! So glad to read your comment here. You made my day. And I could feel how happy you were when your husband requested this soup again. It's because of your labour of love. Hooray! Hi Christine, love the hot & sour soup. What are some bamboo shoot substitutes ? Kids not a big fan! Thanks! Simply skip the bamboo shoots. It won't alter the taste of the soup at all.